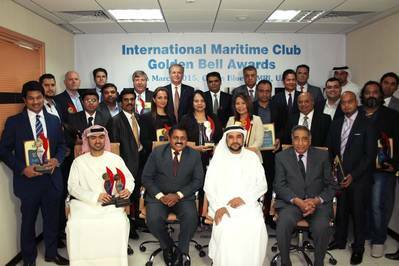 Drydocks World and Maritime World have won the Excellence Award given by the International Maritime Club at the Golden Bells Awards 2015 - Middle East. Drydocks World Group has won the Best Maritime Conference Award in recognition of their successin organizing the “2nd Mare Forum Dubai 2015,” which held its second edition on the 21st of January 2015 under the patronage of HH Sheikh Hamdanbin Mohammed bin Rashid Al Maktoum, Crown Prince of Dubai, Chairman of the Dubai Executive Council. “The 2nd Mare Forum Dubai 2015” the Dubai Global Summit of Marine and Maritime Leaders provided an interactive platform to network and debate contemporary themes in the shipping, marine and maritime industries. The forum featured elite dignitaries and distinguished speakers participating from various maritime sectors. This award recognizes the Group’s sincere efforts in holding a specialized conference that addressed developments and the future outlook of the marine and maritime industry, covering salient issues and topics. Drydocks World group has succeeded in winning the Best Creative Branding Award which recognizes implementation of the latest modern technologies in providing excellent representation and images of new innovative projects. Drydocks World has an exceptional track record of constructing major projects in the offshore oil and gas sector, which has led to an influx of opportunities, including the signing of “DolWin 2” which has been delivered last year and “BorWin3” which is being built for the German renewable energy sector. The award committee members include many of the associations’ heads and members of the International Maritime Club, as well as a number of highly credible panelists in the marine industry. Award-winning companies and personalities were selected for the Golden Bells Awards 2015, recognizing an impressive level of excellence in their category. Drydocks World and Maritime World Group received the awards during a ceremony organized at the Aries International Maritime Research Institute, Sharjah on 28th March 2015, in the presence of an elite group of academics, policy makers and executive leaders who represent various marine and maritime industries.The International Maritime Club (IMC), a non – profit world body of 200 plus maritime and offshore organizations has served the maritime industry for over 6 years, working for the conscious and continuous development of the vast maritime industry. This is a platform where professionals from various sectors of the maritime industry come together under one roof to exchange knowledge and ideas on maritime trade and industry.